Paper Dolls was founded in January 1999 by a group of women who were determined to show that women did not just sit home with the children waiting for their men during WWII. What had seemed like a silly conversation turned serious, as we realized that if we combined our efforts, and did things together, we could get much further in gaining the respect of historians and other Living History supporters. 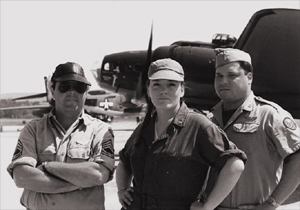 We portray women from all walks of life who each served their countries in their own unique way, from the hometown sweetheart to French Partisans. Some impressions include American Red Cross volunteers, Army and Nav Nurses, women soldiers in the ATS, WAAF, USMC, WAC, CWAC and WAVE, German DRK Nurses and Helferin, as well as the women pilots, and even Russian snipers and infantry women. We have impressions for almost every wartime nation. We do it all, and we are proud to do it well.